Carbon monoxide can act as a substrate for different modes of fermentative anaerobic metabolism. The trait of utilizing CO is spread among a diverse group of microorganisms, including members of bacteria as well as archaea. Over the last decade this metabolism has gained interest due to the potential of converting CO-rich gas, such as synthesis gas, into bio-based products. Three main types of fermentative CO metabolism can be distinguished: hydrogenogenesis, methanogenesis, and acetogenesis, generating hydrogen, methane and acetate, respectively. Here, we review the current knowledge on these three variants of microbial CO metabolism with an emphasis on the potential enzymatic routes and bio-energetics involved. Methanogenic archaea: ecologically relevant differences in energy conservation. Most methanogenic archaea can reduce CO(2) with H(2) to methane, and it is generally assumed that the reactions and mechanisms of energy conservation that are involved are largely the same in all methanogens. However, this does not take into account the fact that methanogens with cytochromes have considerably higher growth yields and threshold concentrations for H(2) than methanogens without cytochromes. These and other differences can be explained by the proposal outlined in this Review that in methanogens with cytochromes, the first and last steps in methanogenesis from CO(2) are coupled chemiosmotically, whereas in methanogens without cytochromes, these steps are energetically coupled by a cytoplasmic enzyme complex that mediates flavin-based electron bifurcation. The phylogeny of the genus Clostridium: proposal of five new genera and eleven new species combinations. The 16S rRNA gene sequences of 34 named and unnamed clostridial strains were determined by PCR direct sequencing and were compared with more than 80 previously determined clostridial sequences and the previously published sequences of representative species of other low- G + C-content gram-positive genera, thereby providing an almost complete picture of the genealogical interrelationships of the clostridia. The results of our phylogenetic analysis corroborate and extend previous findings in showing that the genus Clostridium is extremely heterogeneous, with many species phylogenetically intermixed with other spore-forming and non-spore-forming genera. The genus Clostridium is clearly in need of major revision, and the rRNA structures defined in this and previous studies may provide a sound basis for future taxonomic restructuring. The problems and different possibilities for restructuring are discussed in light of the phenotypic and phylogenetic data, and a possible hierarchical structure for the clostridia and their close relatives is presented. On the basis of phenotypic criteria and the results of phylogenetic analyses the following five new genera and 11 new combinations are proposed: Caloramator gen. nov., with Caloramator fervidus comb. nov.; Filifactor gen. nov., with Filifactor villosus comb. nov.; Moorella gen. nov., with Moorella thermoacetica comb. nov. and Moorella thermoautotrophica comb. nov.; Oxobacter gen. nov., with Oxobacter pfennigii comb. nov.; Oxalophagus gen. nov., with Oxalophagus oxalicus comb. nov.; Eubacterium barkeri comb. nov.; Paenibacillus durum comb. nov.; Thermoanaerobacter kivui comb. nov.; Thermoanaerobacter thermocopriae comb. nov.; and Thermoanerobacterium thermosaccharolyticum comb. 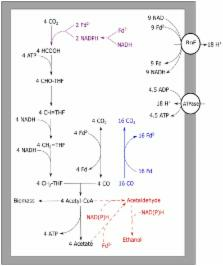 nov.
Acetogenesis and the Wood-Ljungdahl pathway of CO(2) fixation. Conceptually, the simplest way to synthesize an organic molecule is to construct it one carbon at a time. The Wood-Ljungdahl pathway of CO(2) fixation involves this type of stepwise process. The biochemical events that underlie the condensation of two one-carbon units to form the two-carbon compound, acetate, have intrigued chemists, biochemists, and microbiologists for many decades. We begin this review with a description of the biology of acetogenesis. Then, we provide a short history of the important discoveries that have led to the identification of the key components and steps of this usual mechanism of CO and CO(2) fixation. In this historical perspective, we have included reflections that hopefully will sketch the landscape of the controversies, hypotheses, and opinions that led to the key experiments and discoveries. We then describe the properties of the genes and enzymes involved in the pathway and conclude with a section describing some major questions that remain unanswered. Copyright statement: Copyright © 2015 Diender, Stams and Sousa. Aeration and fermentation strategies on nisin production. Effect of nisin and monensin on rumen fermentation in the artificial rumen.